You ever wonder if there are any Supporters that aren’t draw Supporters? Sometimes it just feels like all of them are draw stuff, and we just reviewed one that wasn’t yesterday! Ultra Recon Squad is a Supporter card that requires you to discard up to 2 Ultra Beasts from your hand, and then you draw 3 cards from your deck for each one of those Ultra Beasts. It’s really something for more dedicated Ultra Beast builds, boosting their consistency for sure, but it could have a place in decks that just have more than one or two UBs running around. The best way to figure if it’s worth running Ultra Recon Squad is to figure out the pluses and minuses of the card and its effects. Playing the card takes away a card in your hand (naturally), but then you have to give up at least one more card on top of that. Discarding 1 UB gets you 3 cards, meaning you ultimately benefit as a +1 (losing 2 cards to play URS, but gaining 3 cards from your deck), while discarding 2 UBs gets you 6 cards total for a +3 (losing 3 cards to play, but drawing 6 cards in total). It’s definitely worth looking into at that point. It’s at its best when discarding 2 UBs. Otherwise, it’s just a poor version of cards like Cheren/Tierno/Hau (all of which draw 3 cards but don’t require a discard) – and nobody runs those. So the more UBs you’ve got, the better. But since it does require those, it’s probably not a good staple 4-of…maybe more of a 2-of. Definitely worth some experimentation. Arora Notealus: At least the Ultra Recon Squad are doing what they can. With more Ultra Beasts in this set and in upcoming sets, it’s likely that this card will see more play if there are dedicated enough builds towards these different UBs. Otherwise, it’s probably best to stick to one or two other draw Supporters. Next Time: Flashback to a card that might actually be getting reprinted soon? Today, we’re looking at Ultra Recon Squad, a Supporter card that lets you have the option to discard up to two Ultra Beasts from your hand and draw three cards for each Ultra Beast you’ve discarded, which would net you six cards. This is extremely specialized. In terms of draw power, it is weaker than Professor Sycamore and N. As for discarding Ultra Beasts, there are some of them that are actually good that you don’t want it to be discard fodder. One may argue that you can recover such cards later on with Super Rod or Rescue Stretcher. Tossing Ultra Beasts won’t help Naganadel-GX at all, since Beast Raid counts Ultra Beast in play, not in discard (though it would be nice to include that). Overall, I don’t think this card will see much play. The only time it’ll shine is Limited, where if you pulled a couple of Ultra Beasts, you may make the draw power worth the discard. Ultra Recon Squad (FLI 131) makes its debut in the Forbidden Light expansion set. This card stands as most likely the best draw support card in the set, and for Beast Box decks, it’s a definite four of. For everybody else… meh. I ran four of these in my Beastie Boys deck, and I really liked it. It is a huge advantage to be able to draw six cards without having to discard any cards (well, any cards you really need) or shuffle cards back into your deck. And I was almost always able to draw six cards – the only time there’s really any counter synergy is at the beginning of the game when you want to get Ultra Beasts down on your bench to power up Beast Raid. However, even early you really should throw them away because chances are good that you’ll draw into Ultra Space, a Rescue Stretcher, Mysterious Treasure, or even a Pokemon itself. For pretty much every other deck, however, URS is a pass. Chances are that you’re just not going to have enough Ultra Beasts in a deck to really benefit from this card. I haven’t tried it with any deck outside of the Ultra Beast Toolbox deck. Ultra Recon Squad is a great card in the Naganadel GX Beast Box deck, and we know that archetype is only going to get better as we get more Ultra Beasts. URS may be in your binder most of the time today, but in an expansion or two, we might even see Ultra Beast Toolbox archetypes evolve beyond the current Naganadel centered one we have right now. The third “runner-up” card we are looking at this week is Ultra Recon Squad (SM – Forbidden Light 114/131, 131/131). It isn’t the third runner-up, however. Ultra Recon Squad only made one individual Top 10 list, but it placed pretty high a it ndalso made two of the reviewer’s Top 15 lists; it was my 13th place pick. All of this means it earned 49 voting points, five less than yesterday’s Lysandre [Prism Star] and only two more than what we’ll look at on Friday (Thursday will be a Throwback). If our countdown had been a little longer, Ultra Recon Squad would have secured 12th place. Ultra Recon Squad is a Supporter, specifically a “draw” Supporter, which means it faces some very steep competition. 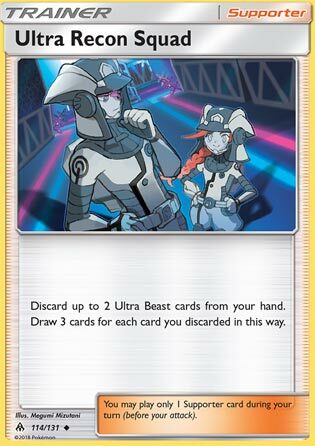 Ultra Recon Squad requires you discard one or two Ultra Beast cards to draw three or six cards (respectively). To give you an idea, the current must-run draw Supporters for nearly any competitive deck are Cynthia, N, and Professor Sycamore. Cynthia has you shuffle your hand into your deck and draw a new hand of six cards, N has both players shuffle their hands into their respective decks and draw a new hand equal to that player’s remaining Prize cards, and Professor Sycamore has you discard your hand but then allows you to draw a new hand of seven cards! Even looking at the Supporters few (if any) competitive decks run, you’ve got Hau to draw three without any other costs or effects (good or bad), Looker to draw three cards from the bottom of your deck, Lillie to draw until you have six cards in hand (eight if it is your first turn), and even Professor Kukui allows you to draw two BUT ALSO do an extra 20 damage. Ultra Recon Squad requires your deck have a significant Ultra Beast presence and you’re only netting one or three cards once you deduct for the cards lost from hand. With Hau, a card we don’t use competitively, you net two cards as all you lose from your hand is Hau himself! …but only Ultra Beast decks. It doesn’t have to be Beast Box, it doesn’t have to be pure Ultra Beasts, but it does need a significant Ultra Beast presence or else it’ll whiff too often. I don’t think I’d leave out Cynthia or N for Ultra Recon slots, either. Instead, this gives you a draw option that won’t potentially backfire as badly as Professor Sycamore. There’s also the future; once rotation happens, N and Professor Sycamore are gone. So Ultra Recon Squad isn’t brilliant, but it has a place in competitive play. At least, that’s the theory; there were two tournaments that included SM – Forbidden Light this past weekend. I do not yet have access to lists for the full Top 8 of either event, but so far it looks like there weren’t any Beast Box (or other Ultra Beast heavy) decks. They might be hiding in the gaps OR people may just be holding off before running them, or maybe I was wrong. For now, I’m going with Ultra Recon Squad being a good draw option and probable inclusion for Ultra Beast heavy decks and assuming that sooner or later we’ll have at least one competitive Ultra Beast deck. This applies to both Standard and Expanded. For Limited Format play, as long as you’ve got at least a couple Ultra Beasts in your deck unless you cannot afford to discard them, I’d include Ultra Recon Squad; draw power is just too precious here.